A lobtailing right whale on our last day on the water. #22: Two Entanglements in Two Days! On September 26th, the right whale crew headed out on the Bay of Fundy for what we thought would be our last survey of the season. Our usual survey destination in the Grand Manan Basin yielded only a couple of right whales and three sperm whales. After many hours, we decided to head to the Wolves (a small cluster of islands east of Campobello Island, N.B), since fellow researcher Moe Brown had been there earlier in the day and had found about two dozen right whales. By the time we arrived at the Wolves, it was late in the afternoon and we were losing daylight fast. The area around the Wolves was thick with right whales, so we set to work and attempted to document the individuals in the area. We headed home as the light began to fade and the seas began to get a bit too bumpy for working. 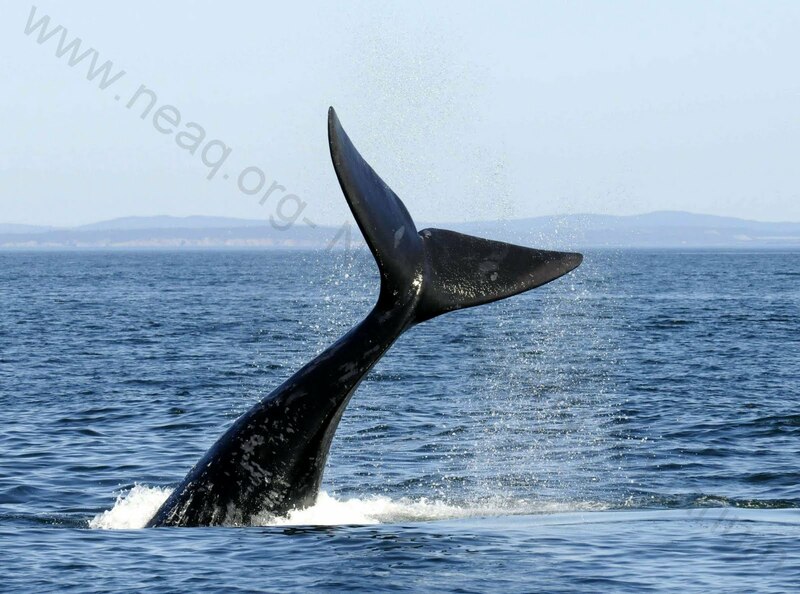 When we arrived back at the dock, Moe notified us that upon reviewing her images of right whales from the day, she detected one that was entangled (Catalog # 3302, an 8 year old male). The entangling line was difficult to see because of the dark color of the line against the whale's black body. The team quickly went to work making logistical arrangements for the next day. "How many people do we have and how many boats can we get on the water?" We know from past experience that finding a single, specific whale in the Bay of Fundy is the proverbial needle in a haystack. With not much sleep, the team headed out at first light the next morning. Joining the search were two vessels from Campobello Island, captained by Mackie Greene from the Campobello Whale Rescue Team (CWRT) and Jerry Conway from the CWRT and the Canadian Whale Institute, plus the NEAq team on the R/V Nereid. A private boat with Chris Slay of Coastwise Consulting and friends onboard offered to help the effort! In total, we were four boats and 15 people. We also alerted the local whale watch boats and asked them to keep a sharp lookout for the entangled whale. After many hours of looking at the numerous right whales east and south of the Wolves Islands with no luck, the Nereid crew ventured south and east to the Grand Manan Basin to see if the animal may have moved there. Around noon, the crew of the Nereid hailed the two rescue boats with a position- the Nereid had NOT found #3302, but instead had found a second entangled whale, #3111 (a 10 year old male)! The rescue boats arrived on scene and Mackie and Chris, both highly qualified disentanglement experts, quickly began assembling their equipment in the smaller of the two rescue boats. It should be noted that Mackie and Chris use special tools designed for this specific purpose and have been extensively trained for disentanglement. In addition, Mackie has received special authorization from the Department of Fisheries and Oceans to lead this type of operation. The work is dangerous, so the appropriate safety gear was donned. Amy Knowlton gave a quick debrief of the type of entanglement and the body parts involved. I hopped aboard to document the event, and just like that, the whale surfaced and we were underway. The peduncle wound, caused by several lines. Over the next couple of hours, the whale was approached by the rescue crew each time it surfaced, and various, proven disentanglement techniques were used. On one approach, Mackie managed to get a knife tool into the bundle of four lines coming from the whales left flipper. At this point it appeared that something shifted and changed with the entanglement. Upon the next surfacing, the lines that had crossed the whale's peduncle had moved, and for the rest of the afternoon, we did not see the lines over the peduncle again. It is unclear if the lines were cut or the entanglement shifted in some way. We do not know if any line remains on the left flipper or perhaps even in the left side of the mouth, but we are hopeful that over time the gear might be shed. What we do know for sure is that because of the extensive effort of four boats and 15 people, this whale has a much better chance of survival. The disentanglement team works to cut the lines off the whale. Now, we wait and anticipate the next sighting of this whale. We and our colleagues will also be keeping a watchful eye out for #3302, the entangled whale that unfortunately was not found again.